Yesterday I finally tried out JMom’s bibingka recipe. 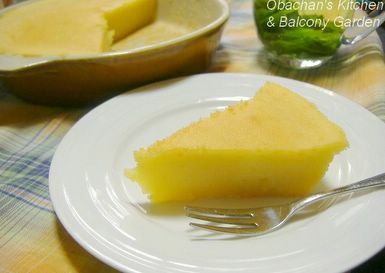 When I read her post about this Filipino dessert, I got so curious because the recipe called for mochiko (rice flour) instead of regular flour. I HAD TO find out what it would taste like when mochiko is mixed with my favorite ingredients like coconut milk and sour cream. So I tried it -- and loved it very much! I don’t know if this was a weird thing to do, but I enjoyed this dessert with hot fresh lemongrass tea. Now, this is something you don’t see very often. Lucky you! 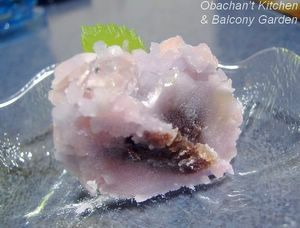 ;) I mean, most people in Japan do not make tokoroten AND mizu-yokan at one time from scratch like this. Yes, when I say from scratch, I’m not talking about making them from kanten bars. I’m talking about making them from SEAWEED. 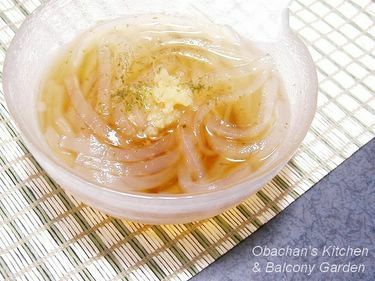 If you are not familiar with tokoroten (agar noodles), this post tells you how we make/eat the noodles, as well as how my mom is involved in this tokoroten project (?!). 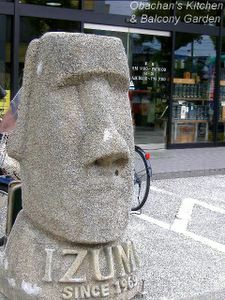 OK, then, what is mizu-yokan? 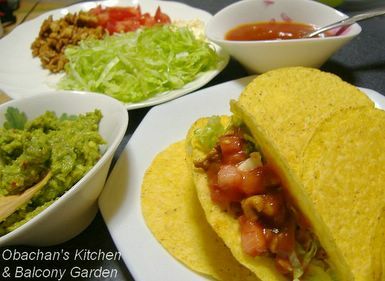 Here is a good explanation of what it is with a recipe and nice photo by Reid of Ono Kine Grindz. His recipe calls for kanten bars, of course. 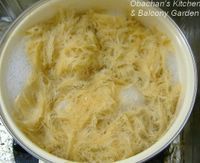 I bet any other yokan or mizu-yokan recipes call for kanten bars or kanten powder; no recipe would tell you to go to the beach and pick tengusa seaweed first. Of course not everyone lives near the beach, and the seaweed has to be dried for several weeks, but that’s not the only reason. 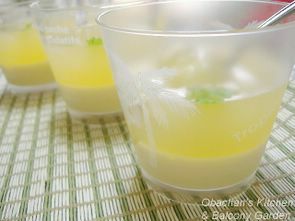 For the better taste of kanten desserts, using kanten bars/powder is recommended over gelatin liquid just extracted from tengusa seaweed. 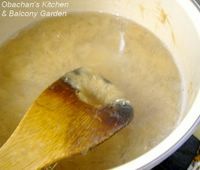 When we cook the seaweed to obtain the gelatin liquid, we add a little amount of vinegar. I’m not quite sure why, but they say that it probably won’t set well without the vinegar. 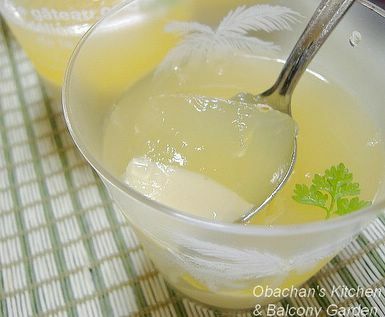 Thus, the seaweed gelatin liquid is largely tasteless but has a slight hint of the flavor/smell of the seaweed and vinegar, which you don’t really want for your desserts. 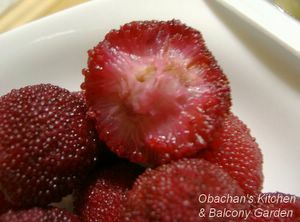 Kanten bars do not have that problem because such unwanted flavors are taken away during the repeated freezing process. 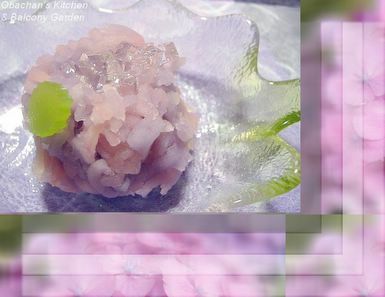 That's why kanten bars are more ideal for making wagashi. But looks like many housewives in my hometown did not care too much about such a minor(?) problem. 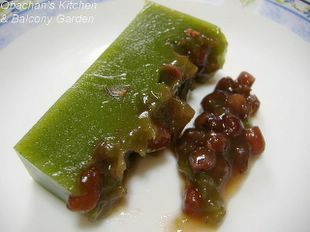 If you cook tengusa seaweed once, you usually end up with quite a bit of gelatin liquid. 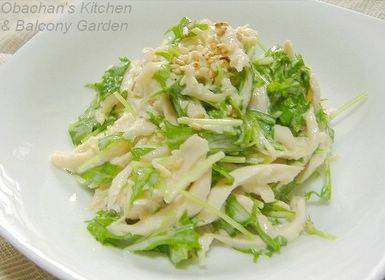 If agar noodles was the only thing you can make out of it, you and your family will get tired of the noodles. Then why not go for more variety? Maybe you can hide the slight hint of the seaweed and vinegar by adding a lot of sugar and something with a strong flavor. Yeah, why not? 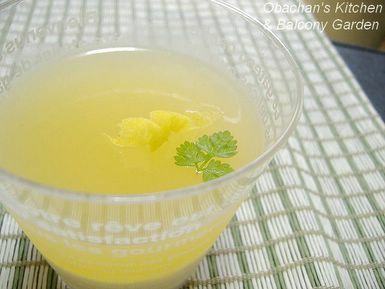 So, in my hometown, it has been quite popular, when making agar noodles, to set aside some of the seaweed gelatin liquid and use it for making desserts like coffee-kan, umeshu-kan, nikkei cinnamon-kan and Soda-kan. For today’s experiment, I decided to go for mizu-yokan, and to give it a stronger flavor, I chose matcha mizu-yokan. 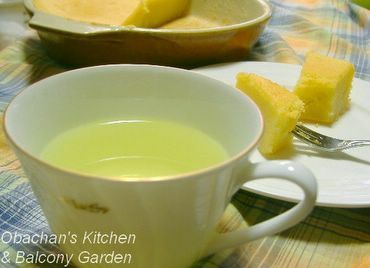 Now I'll show you how I made tokoroten and matcha mizu-yokan. 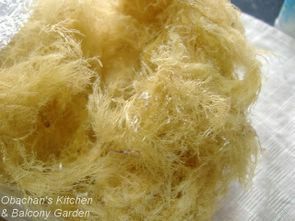 The left photo is dried tengusa seaweed. (It looks like this when in the ocean, but after repeated washing and drying, it turns beige.) First, you need to wash it well. Then it'll look like the right photo. I added water and cooked the seaweed for apx. 30 minutes. In the beginning it looked like the left photo. Then I added vinegar and cooked for another 30 minutes. The seaweed became very soft and the soup was thickened as in the right photo. BTW, the smell of cooking seaweed and vinegar was not very pleasant! I drained it in a cloth bag, waited until it cooled a little, and while the seaweed was still warm, squeezed out the liquid as much as possible. 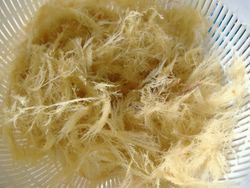 The tengusa seaweed looked like this after squeezing (above left photo) and I got the tasteless and colorless gelatin liquid (above right photo). 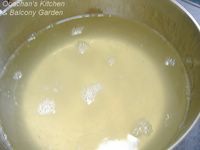 To make tokoroten noodles, the liquid needs to be poured in a flat container. 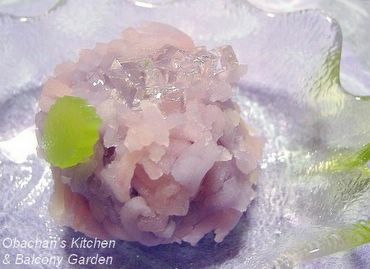 What’s fascinating is that, unlike animal gelatin, kanten sets at room temperature and turns out very firm. But it tastes better when chilled, so I put it in the fridge after it was set. Now, from here, it gets in a real experimental phase. 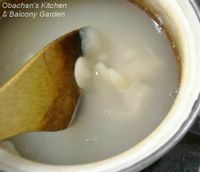 I added shiroan (sweetened white bean paste), sugar and pinch of salt to the remaining warm gelatin liquid and stirred well over low heat to dissolve them completely. In another bowl, I mixed matcha, sugar and a little hot water, then added some gelatin liquid and mixed well. 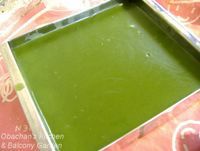 The matcha mixture was then poured into the rest of the gelatin-shiroan mixture which had been removed from heat. When the whole mixture was properly flavored with matcha and colored dark green, I strained it through a sieve twice to remove tiny matcha lumps. So far, so good. 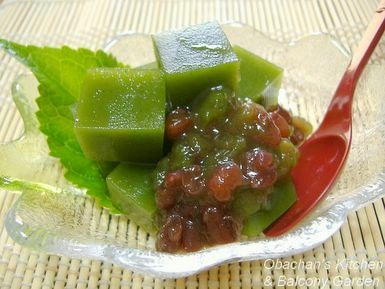 To make it look good and taste good, I wanted to add some boiled azuki beans to my matcha mizu-yokan. But actually that was the beginning of the tragedy. 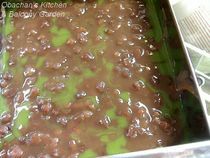 When I opened the can of boiled azuki beans, I found that it was half-mashed, almost paste-like beans, not the boiled azuki beans I had in mind. There was no way they could elegantly float here and there in my mizu-yokan, so I changed my plan and tried to make a thin layer of azuki at the bottom of the matcha mizu-yokan (left photo). I poured the rest of the mixture on top, and again, when it was almost set at room temperature (right photo), I put it in the fridge. I forgot to post about it in my previous garden report, but my lemongrass was getting taller and taller. 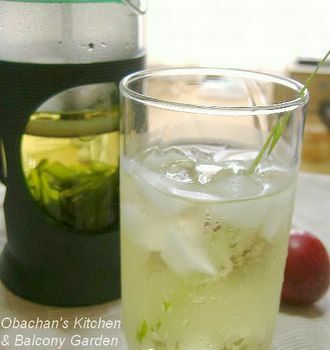 Other plants around it (tomato, basil and mizuna) seemed unhappy, so I cut most of the lemongrass leaves this morning and made this fresh lemongrass tea, inspired by this Japanese site. 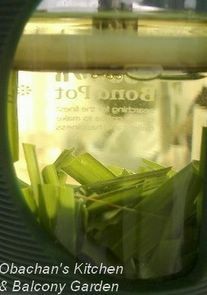 I’m drying the rest of the lemongrass leaves. This is something I whipped up today. I’ve been feeling lazy all day, with the depressing rain outside and all. I didn’t feel like cooking something elaborate, following the recipe precisely, step-by-step. 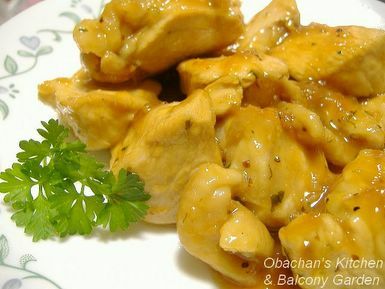 So I just went through several orange chicken and sherry chicken recipes to get some basic ideas, and when cooking, I didn’t measure any of the ingredients with a measuring cup or measuring spoons. 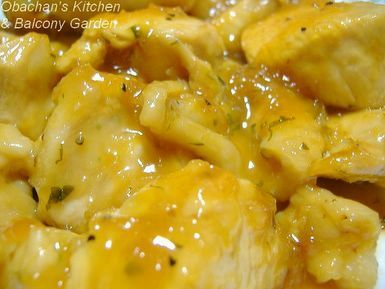 What were the ingredients for this orange chicken? A chicken breast, salt & pepper, dry sherry, garlic, ginger, soy sauce, a dash of lemon, whole-grain mustard, parsley from my balcony garden, and one more thing. 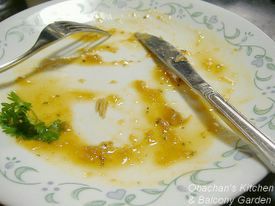 To give an orange flavor to the chicken, I used something in place of orange marmalade. Can you guess what it was? To my surprise, this orange chicken was not bad. Maybe a little too sweet, but not bad at all. * OK. Now, here's the answer: I used mom's burnt orange jam for this orange chicken. The soy milk was seasoned with sugar and some white rum. I thought about adding the liquor to the orange juice, but I finally decided against it because I preferred the fresh taste of konatsu as is. BTW, do you like these plastic cups? 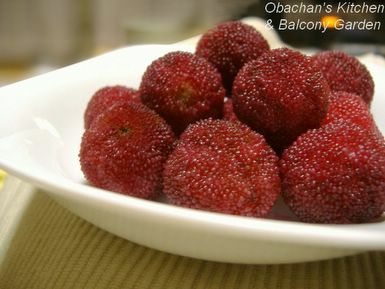 I saved them after we ate store-bought gelatin desserts (coffee jelly and mango jelly) in the office. Yep, the tropical-looking one had mango jelly in. Remember how it looked just one month ago? 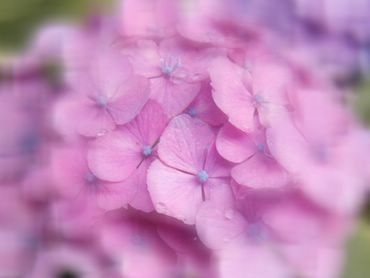 All the leaves were green, looking completely healthy, and pink flowers were so lovely. Then it happened. At the end of May, some leaves started turning yellow. 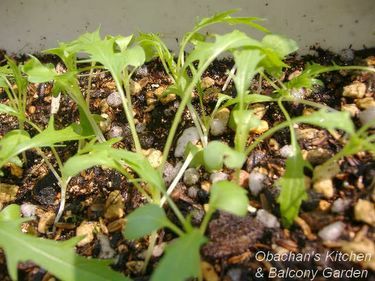 Then more and more leaves… When I looked close, I found tiny black spots on the leaves. 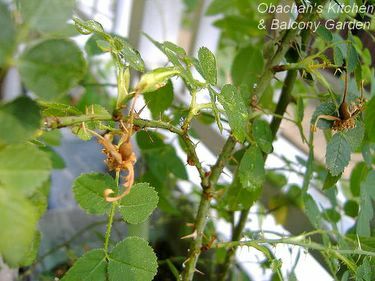 This is a common rose disease, right? 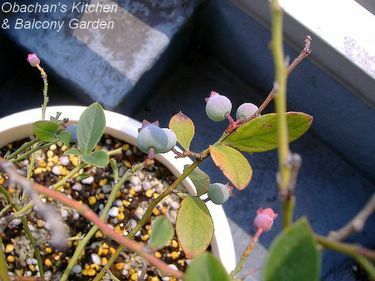 Well, let’s not be too disappointed, because other plants are doing fine. 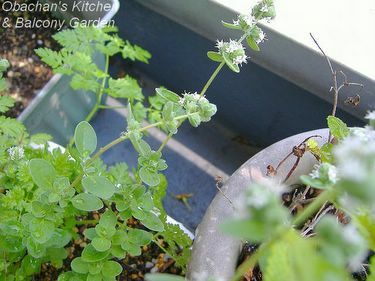 Sweet Marjoram (blooming) and chervil. They are just perfectly fine. Mizuna mustard. This is a less-bitter variety which is good for salad. According to the package, the seeds came from Denmark! Is mizuna popular over there??? Mom’s neighbor gave her 2 young tomato plants and this is one of them. 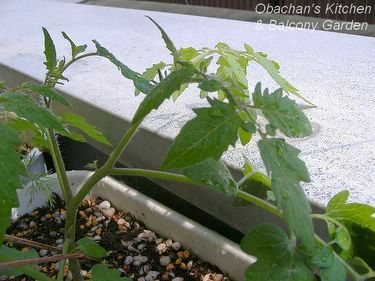 According to the neighbor, this is supposed to have oblong tomatoes, so I hope this is an Italian tomato plant. 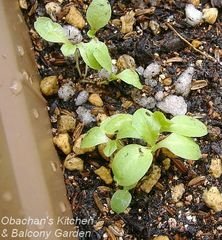 If so, I’ll make dry tomatoes this summer! Dill is doing fine, as always. 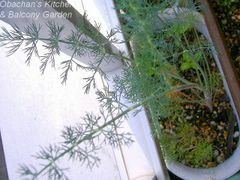 I’m hoping to be able to get more dill seeds than last year. 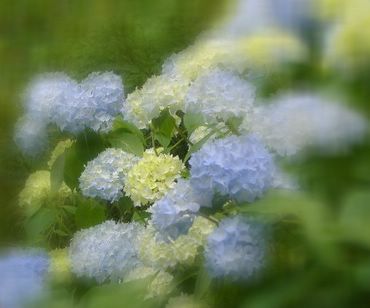 When the humidity proves the beginning of the rainy season here, my memories of the South come back and I always feel the urge to make some southern dishes. 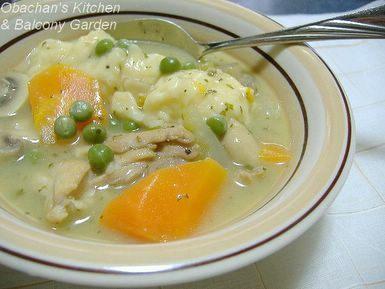 Inspired by the Chicken and Dumplings entry by Randi of Culinary Adventures, I made this for lunch yesterday. When in the States, I always used Bisquick for making the dumplings. But I have read somewhere that for a real chicken and dumplings dish, the dumplings should be made from scratch. And now I’m fully convinced! The chicken and dumplings recipe called for dry sherry, and it gave me a perfect excuse to buy my first bottle of it. When you want to buy rare (well, rare in Kochi, Japan, at least) imported liquor in Kochi, this is where you should go. As far as I know, they have the best variety of imported liquor in this prefecture. Everything I wanted including Marsala wine was available at this liquor shop. Always. Usually in the daytime, there’s only an old man or his wife in the shop. What’s impressive is that they always understood the name of the exotic (I mean, for most of the elderly in town) liquor I told them. They never ever looked like “What the hell is that drink you are talking about? I’ve never heard of it.” But to locate the requested liquor in the shop, they always needed to call their son on the cell phone and asked where it was. And they found it. Always. When I finished baking thumbprint cookies with mom’s burnt jam the other day, another idea popped up in my mind. 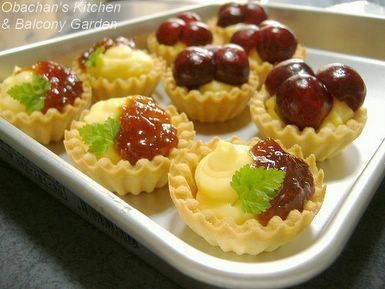 The idea was using the jam for tarts. But if I put the jam alone in cookie tart shells, isn't it almost the same as the thumbprint cookies which were not bad but not really a great success? So I thought about combining the jam with pastry cream. 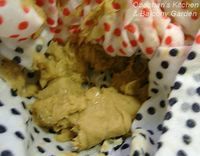 Luckily, I have a good pastry cream recipe that one of the readers (she called herself "a fellow baker") gave me in her comment to my post about a year ago. 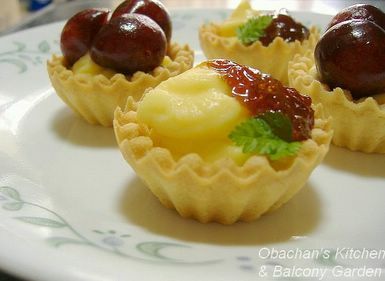 I made the pastry cream over and over to try it with various kinds of fruits or jam, and I liked it every time. Most of the time I used heavy cream to make the half-and-half called for in the recipe, but this time I used vegetable whipping cream to make it lighter. Since mom’s jam had a little strong taste and slight bitterness, I thought rich cream might be overwhelming. 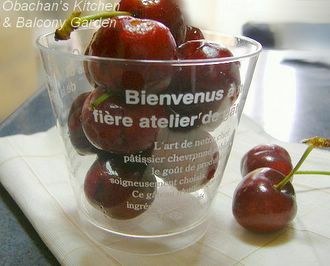 These American cherries were bought for a back-up plan. 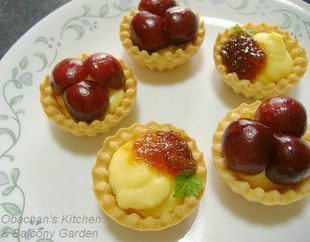 If the test batch of the jam & cream tart would taste terrible, I was going to give up on the idea right away and make cherry & cream tarts with the rest of the pastry cream and tart shells. The pastry cream made the taste of mom’s jam a lot milder and gave a different kind of sweetness to it, so the slight bitterness from the jam became a pleasant aftertaste. 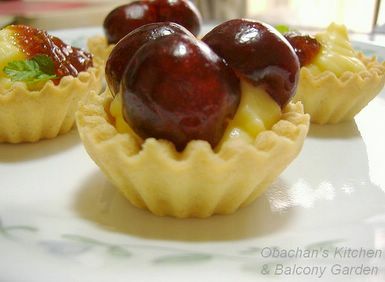 Honestly, the tart would have been rather bland without the bitterness.The cream also supplemented sweetness for the cherries and made them taste a lot better. 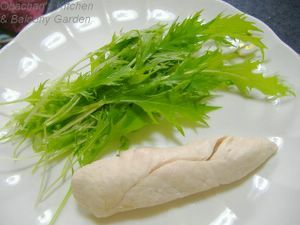 * Note that now I have chervil leaves to garnish my desserts. ;) Yep, they are from my balcony garden. BTW, the shells are store-bought cookie tart shells. 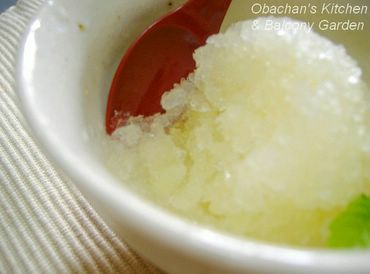 Because it is colorless, this konatsu sorbet may not look tasty, but actually it IS very flavorful. I think I added just right amount of sugar to the konatsu orange juice this time. 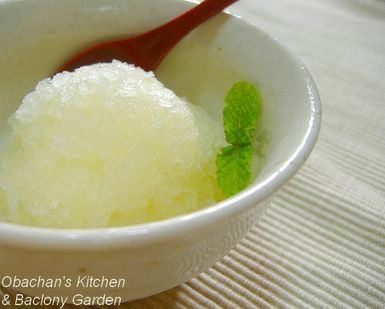 The sorbet turned out not too sweet, not too sour… just perfect for me, and it tastes so refreshing after a spicy or greasy meal.